Saleurn Ramos is a flow artist. She specializes in hoops and is also proficient in Staff & Ropedart. She comes from an athletic background having been a competitive snowboarder prior to finding flow arts. Although she has no formal dance training she has always been drawn to creative movement and music. She has been a practitioner of Yoga for the past 15 years, and is a certified 200 hour Yoga teacher. She feels that her Yoga lends a unique style to her flow arts practice. Saleurn started hooping in 2009. She has taken various trainings with the pioneers of Hoopdance Christabel Zamor, Anah Reichenbach & Rayna MacInturf. She is the only hoop dancer in Washington State who is triple certified to teach hoop classes. She has inspired many to start hooping & is a conductor of creative movement. She has performed for audiences of all sizes from an intimate beach wedding, community shows, night clubs & in front of thousands on stage at FreakNight one of Seattle’s largest raves. 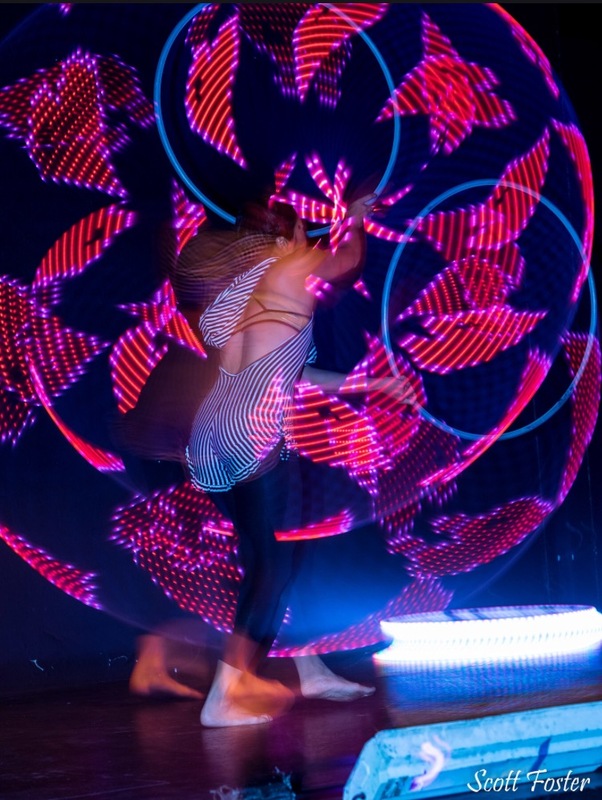 She is the founder of the Hoop Bots a versatile troupe based out of Snohomish county.